Over the past two decades, bilateral relations between the two countries have gone from strength to strength, quickly growing from a partnership to a strategic partnership to what is now a comprehensive strategic partnership (CSP). The CSP, signed in 2010, prioritises enhancing frequent high-level political exchanges and advancing trade and investment. To this end, bilateral mechanisms such as the Bi-National Commission, Joint Working Group, and the Institute for Strategic Dialogue have been established to facilitate and enhance political interests and economic objectives. It is worth noting that the most recent people-to-people exchanges between China and South Africa took place when China designated 2014 as the Year of South Africa in China. Similarly, South Africa designated 2015 as the Year of China in South Africa. In April 2017, South Africa successfully hosted the first South Africa-China High-Level People-to-People Exchange Mechanism (PPEM). This is the latest addition to our structured bilateral mechanisms and the first PPEM China has with an African country. The PPEM focuses on 10 areas of cooperation including culture, education, health, sports and tourism. We expect to make even greater progress through this mechanism in the area of people-to-people exchanges. Our bilateral relations are central to realising our socio-economic development agenda through our foreign policy as we increase our efforts to implement the National Development Plan, cooperating in the areas of trade and investment, agriculture, the environment and skills development. During the past 20 years, South Africa and China also cooperated closely with international organisations and strongly supported each other in numerous global affairs. The friendship and mutual trust have been further deepened and strengthened. 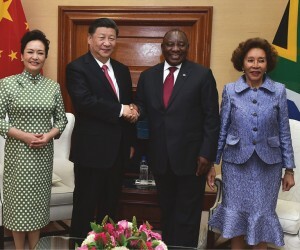 In July, the South African President, Cyril Ramaphosa, welcomed the General Secretary of China, Xi Jinping, amid his state visit to the country, ahead of the 10th BRICS Summit and discussions between the two heads of state regarding investment deals and memorandums took place. It was announced that China has promised financial investment in South Africa to the value of US$14.7-million (R196 billion). This would be a significant boost to Ramaphosa’s international drive to raise US$100 billion in investment over the next five years. President Ramaphosa stated that sectors due to benefit from the foreign investment, include general infrastructure, ocean economy, green economy, agriculture and finance. At the same joint-press conference, Jinping himself announced that China would take “active measures” to boost imports from South Africa to support the country’s development agenda and priorities. The state-owned China Development Bank has also agreed to lend US$2.5-billion (R33.7-billion) to the cash-strapped power utility, Eskom, to complete the coal-powered Kusile Power Station Project in Mpumalanga. And a US$300-million (R4-billion) loan from Industrial and Commercial Bank of China (ICBC) will go to another ailing state-owned enterprise, Transnet. 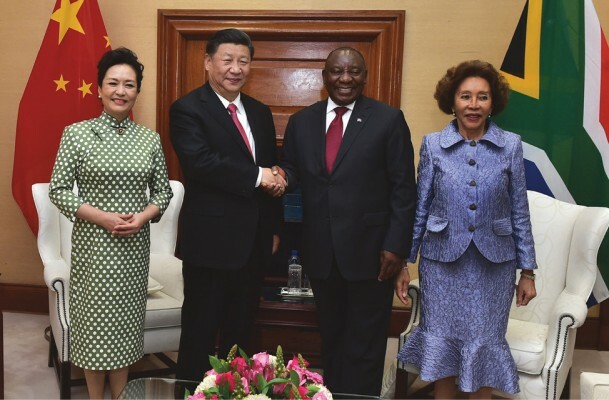 The two loans deals were among 14 different agreements signed between the South African and Chinese government departments, SOEs and private companies after the Ramaphosa-Jinping official meeting. The Daily Maverick reports that the Trade and Industry Minister, Rob Davies, explained to journalists that the measures which Jinping had agreed to take to boost South African imports included sending more buying missions to South Africa, with a focus on purchasing value-added goods from this country. Pretoria sees such measures as steps towards establishing a more balanced trade with China, rather than just exporting raw materials to that country, and importing Chinese manufactured goods. As an example of the type of Chinese investment South Africa is looking for, Davies said is the launch of the R10-billion car factory built by the Chinese vehicle company BAIC in the Coega special economic zone near Port Elizabeth. With an investment of US$800 million from BAIC, the joint-venture with South Africa’s Industrial Development Corp is the single-largest Chinese investment on the African continent. With localised production, the plant will create 2 500 direct jobs and 10 500 indirect ones, and will significantly benefit the development of South Africa’s auto-industrial chain, consolidating its position as Africa’s number one automaker. At its full capacity, it will generate an industrial added value of 12.4-billion yuan for vehicles and 6.2-billion yuan for auto parts. According to Xu Heyi, the Head of BAIC, more than 50% of the vehicles made in the plant will be exported, contributing to a trade volume of around 6.2-billion yuan to South Africa. The BAIC plant is situated in the Coega Development Corporation Special Economic Zone. South Africa represents China’s largest investment destination in Africa with an estimated accumulated Chinese Investment of over US$25 billion and South Africa’s investments in China reaching US$660 million, mainly in beer and metals. “What’s special about the Chinese is when they make a commitment to invest, they’re reliable and they make it happen,” he said. Davies added that the Chinese TV and domestic appliance manufacturer, Hisense, would also be expanding its local production. But he also disclosed that South Africa invests a lot more in China and other BRICS countries than they invest in South Africa and that this imbalance needed to be corrected. He said China’s accumulated total investment in South Africa to date was about US$11 billion and that South Africa had invested a greater amount than that in China. South Africa’s investment imbalance with the other four BRICS countries as a whole was even greater. Total outward investment was about US$60 billion against only US$18 billion of inward investment. That’s why he would be arguing at the BRICS Business Forum that BRICS needed to support more investment-led trade. If South Africa could expand its production capacity, it and other BRICS countries could also increase their manufacture of intermediate goods, which would boost trade in supply chains. Davies said about two thirds of world trade was now in such intermediate goods and that the focus needed to be on investment-led trade, not the other way around (as many economists advocate). The news that China will invest in the local economy has supported some foreign inflows. South Africa’s rand firmed more than 1% to a three-day best after President Cyril Ramaphosa said China would invest US$14.7-billion (R195 billion) in the local economy, spurring some offshore demand for the currency. “The news that China would invest in the local economy has supported some foreign inflows,” said a Senior Trader at Standard Bank, Oliver Alwar. “One of the low-hanging fruit for policymakers is boosting sentiment and the announcement by the BRICS envoys could tip the scales a little bit,” said an Economist at ETM Analytics, Halen Bothma. Invited by China, South Africa joined BRICS in 2010 and since then, South Africa has been working closely with China under the BRICS framework. The country’s BRICS membership? has enabled us to promote economic development through enhanced trade and investment, expand sectors in which our country holds a comparative advantage and even provide overseas investment opportunities for South African enterprises. BRICS also provides an opportunity to influence policymaking and alignment among developing countries to make the international economic system more inclusive while strengthening the global order and upholding the principle of multilateralism and the centrality of the United Nations. One of the most important successes of the key achievements of BRICS that reflect the main benefits for South Africa include the first BRICS financial institutions that were created in 2014, namely: the New Development Bank and the Contingent Reserve Arrangement. These institutions are intended not only to complement the existing architecture, but also to additionally leverage the resources of the Global South to directly address the needs (and shortcomings in the existing architecture) of the Global South through mobilising its significant resource base (BRICS foreign reserves are estimated to be around US$4 trillion). BRICS has been a platform for dialogues among experts/academics youth, businesspersons and others. South Africa values BRICS not only as an economic platform but as the voice for the voiceless mass. The diversity in BRICS in terms of political systems, societies and cultures makes it well-suited to foster new ways of engaging in international affairs. South Africa has concluded a successful 10th BRICS Summit that was hosted by President Cyril Ramaphosa from the 25 – 27 July. In attendance were heads of state, Brazil, Russia, India and China and the South Africa Government, Rwanda, Ethiopia, Zambia, Angola, Senegal, Namibia, Jamaica, Uganda, Togo, Gabon, Argentina, the DRC, Botswana, Turkey, Lesotho, Madagascar, Malawi, Mauritius, Mozambique, Seychelles, Tanzania and Zimbabwe. The 10th BRICS Summit was held under an extensive agenda, this was shown in the diversity of discussions—development, economic growth, prosperity, peace and security. According to the statement released by the Presidency, the BRICS countries are firmly in agreement on the need to safeguard and strengthen multilateralism. BRICS leaders committed to the full implementation of the United Nations’ 2030 agenda for sustainable development and its 17 Sustainable Development Goals. The bloc emphasised the need for BRICS countries to heighten cooperation in terms of peacekeeping. BRICS pledged to support African development, industrialisation, innovation and infrastructure development as contained in the NEPAD programmes and the African Union’s Agenda 2063. BRICS endorsed an initiative of enhancing BRICS cooperation in health through the establishment of a BRICS vaccine centre, which will promote research and development in the medical field. The bloc recognised the potential inherent in the tourism sector and in BRICS countries, then endorsed the development of a BRICS Tourism Track within BRICS. The leaders also agreed to women’s empowerment by establishing a BRICS women’s forum. Members of the bloc also signed a Memorandum of Understanding on Collaborative Research on Distributed Ledger and Blockchain Technology in the context of the development of a digital economy. China’s robust economic growth and rapidly expanding presence in global markets have greatly intensified its trade ties with sub-Saharan Africa. China’s remarkable 10% average growth rate between 2000 and 2012 has fueled a steadily rising demand for oil, minerals and other primary commodities, many of which are abundant in sub-Saharan Africa. The top 10 destination countries for foreign direct investment FDI) into Africa account for 77% and 75% of FDI in the region as a whole, both by the number of projects and capital investment respectively. Much of China’s outbound direct investment (ODI) in sub-Saharan Africa is closely linked to trade. Official figures from the Chinese Ministry of Commerce (MOFCOM) suggest that the ODI to sub-Saharan Africa reached US$2.52-billion in 2012 and US$3.4-billion in 2013. In 2012, the total stock of Chinese ODI was US$20 billion, yet this accounted for just 5% of the total inward foreign direct investment stock in Africa. Meanwhile, the importance of sub-Saharan Africa and Africa as a whole in China’s total ODI stock remains below 5% and has not changed much since 2006. In other words, Africa has benefited from China’s rising ODI outflows, but no more so than other regions. Throughout sub-Saharan Africa, China is investing most heavily in energy and the extractive industries, a pattern similar to its investment strategy in other parts of the world. In West Africa, however, Chinese ODI is unusually concentrated in the transportation sector. From 2005 to 2012, the West African transportation sector received 36% of China’s total ODI flows to the region, substantially higher than the 14% average worldwide. Transport equipment is overwhelmingly related to mineral extraction, a sector where Chinese firms are highly concentrated. Transportation was followed by the mining and metallurgy sector; with 32% of total regional investment also well above the 16% average worldwide. Energy attracted the third-largest share of Chinese ODI at 28%, lower than the 46% worldwide average. China’s economic involvement in Africa has taken many forms and information about its financial and trade ties to the continent is not always easily comparable to that of other countries. While official development assistance (ODA) is defined by the Organisation for Economic Co-operation and Development (OECD) to include grants, interest-free loans and concessional loans, Chinese ODA includes the use of financing mechanisms that are outside the OECD’s definition, such as export credits, natural-resource-backed credit lines, subsidies for private investment and so-called “mixed credits”, which are combined concessional and market-rate loans. Therefore, African leaders and governments portray Chinese engagement in the region as positive because of China’s contribution to infrastructure, which impacts the economy. One of the most critical questions facing African policymakers as a whole and West African policymakers, in particular, is how to maximise the benefits of their increasingly tight financial and trade integration with China.